“Of course Tony and Tim want to set a good result as well. Other teams have different options as well, that can definitely be an advantage. It all depends on how they feel and how I feel." On Sunday 19th April it’s time for the Amstel Gold Race, the first of three Ardennes classics. The riders have to cover 34 climbs, spread over 251.1 kilometres. With four ascents of the Cauberg the 50th edition of this Dutch race is suited for the punchers again. 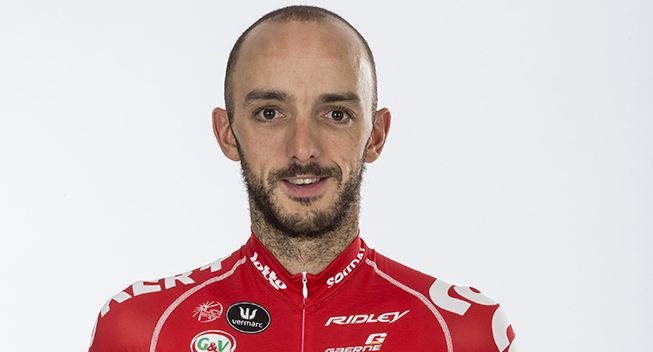 Tony Gallopin, Tim Wellens and Jelle Vanendert who has already been second twice, are part of the Lotto Soudal selection. They’ll try to beat riders like Phillipe Gilbert who had won the Amstel three times, Simon Gerrans, Joaquim Rodriguez, Alejandro Valverde, Michael Matthews and world champion Michal Kwiatkowski. “I had a normal preparation, almost identical to last year," Vanendert said. "I’ve always done it this way. In February and March I have to get race rhythm, but this is my time of the year. When I was fit, I always set good results here. When you have finished second two times you can win here as well. Of course it’s not so simple to do it. There’s no doubt that I’m good. I hope I perform optimally, that the circumstances are right and that I make the right tactical decisions. “Of course Tony and Tim want to set a good result as well. Other teams have different options as well, that can definitely be an advantage. It all depends on how they feel and how I feel; for each of us there are circumstances in which we can win. But we are respectful and professional enough to handle that in the right way. “I decided to sacrifice my participation in the Flemish classics for the Ardennes classics," Gallopin said. "I watched television with a special feeling the past few weeks, because I really love those races. Next Sunday we’ll know if this turns out well, but this choice gives me confidence. The preparation went smoothly. "The Amstel Gold Race and Liège-Bastogne-Liège are two different races. The Amstel is a really nervous race, where you have to be very concentrated, with a specific finish. Liège-Bastogne-Liège is more historical, the roads are smoother and it’s just a bit higher in the hierarchy for us riders. “I hope to set a result as high as possible on Sunday. If I’m one of the last ten riders on the Cauberg, I will be able to play a role in the absolute final phase and I will be very satisfied. My sprint in a small group is an advantage I think. Stig Broeckx, Tony Gallopin, Pim Ligthart, Jürgen Roelandts, Tosh Van der Sande, Dennis Vanendert, Jelle Vanendert and Tim Wellens.